Just finished reading/ listening to Predictable Revenue by Aaron Ross. 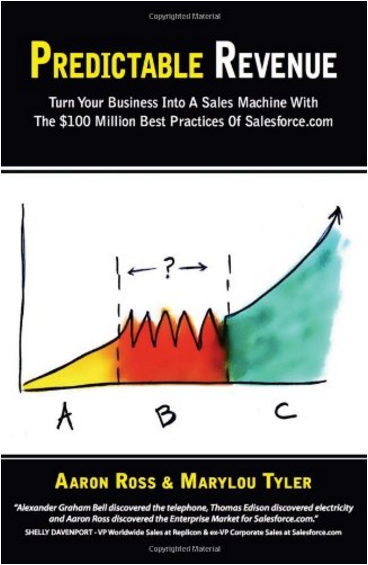 It’s been referred to as the sales Bible by several sales pros. Just so happened I never read it till now. 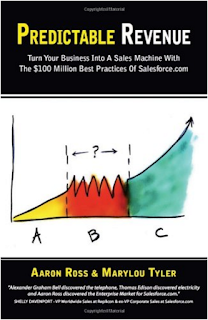 The book is written by former sales leader Aaron Ross as he helped implement the structure and strategies to scale Salesforce.com’s sales model. The importance of structure. This is probably the most highlighted point of the book spanning everything from organization to cadence to sales cycle and reporting. Ross frequently harps on using a sales force automation platform – not a surprise. Value/ Customer first, and pretty much always. Ross highlights the importance of enabling the customer to talk about their business first… just about never talk about your product. Instead, integrate your product/ service in how it can resolve specific challenges of the customer. Customer Success is perhaps the most important facet of the sales process.Executives and boards almost always focus on new customers at the peril of ignoring existing. Hold the hands of your first 10, 20, 50 customers. 80% of the defects and problems in the sales process happens during hand-offs.Ross calls handing off between teams as “passing the baton”. I read this as the issues that arise when discussions and knowledge of the customer is lost from team to team. It’s like the game “telephone”. A successful sale is about both companies. As much as sales is focused on earning the business with a prospect, effort should also be spent on evaluating if the customer is even a good fit for the seller. Too often, sales reps spend time on customers that do not fit the ideal customer profile, and thus, productivity (and indeed sales efforts) slows. This book was recommended to me by several people, but I read it after the Challenger Sale (review here) after the recommendation of a colleague. As you can surmise from this review, Predictable Revenue is much more high-level than the Challenger Sale – Challenger being the more tactical sales approach. There’s a lot of good take-aways, and finer details buried throughout the book, that this will be a reference tool for me in the future.